National People's Front of Ukraina "Rukh"
I've recently moved to Ukraine from the United States and I've come accross a flag question. I've seen for sale on the street and being used in some rallies an alternate version of the Ukrainian flag. It has the same design and proportions as the current Ukrainian flag, but the top half of the flag is black (as opposed to blue) and the bottom half of it is red (as opposed to yellow). In the upper left hand corner of the flag is a gold colored Ukrainian trident. I don't know if it means anything or not, but I've noticed this flag showing up during televion coverage of rallies taking place in the Western half of the country, which is more ethnically Ukrainian than the center or eastern half. I've asked people selling this flag what the difference is between this flag and the offical blue and yellow one, and no one really seems to be able to give me a straight answer. This is the Ukrainian patriotic flag. Red and black flags were used by some Ukrainian scouts organizations in 1930s. Red is a symbol of blood and struggle for independence, and black is a symbol of reach land and memory for heroes. After 1941 one branch of Organization of Ukrainian Nationalists declared red and black as colours of its organization. Now some political parties and movements use red and black, but generally this kind of flag is known as "Patriotic Flag". It is not alternative for National blue and yellow colours. The flag of the All-Ukrainian Party "New force" is at <www.novasyla.org.ua>. The flag usually has the ratio 1:1, as shown here, here, here, here, here and here. On some of the flags with this ratio, both inscriptions are in yellow, like here and here. There is also a variant with both rows of text in yellow and smaller-sized row beneath the larger-sized one, as shown here and here. The most distinctive flag variant has the ratio 2:3, but the enlarged text, all in yellow, occupies hoist and center and a smaller hand is in the fly. This flag can be seen here and here. All-Ukrainian Union "Freedom" was founded in Lviv in 1991 (not 1995, as stated in the messages listed above) as the Social-National Party of Ukraine (Sotsial-natsional'na partiya Ukrayiny) and officially registered in 1995. Its original flag was yellow, charged with a large wolf-hook (Wolfsangel) in blue, which was stylized and officially described as the monogram IN (early medieval forms of Cyrillic letters ІН); these letters stood for the motto "Ideya Natsiyi", meaning "National Idea" (literally, "Idea of the Nation"). In 2004, the party adopted its present name and flag as a part of distancing from its original pro-Nazi ideology called the Social-Nationalism, although its stances and activities are still often described as rather extremist (it has the observer status in the Alliance of European National Movements, whose members are the far-right parties from the European Union member countries). The hand depicted on the current flag is displaying the "trident salute" used by the Ukrainian nationalists, named after the trident symbol form the national coat of arms. The original party flag is still often used by a number of extremist groups which keep declaring themselves as the Social-Nationalists, although they usually have the flags of their own as well, using this flag as the original symbol of their ideology - something they all have in common. Batkivshchyna or the All-Ukrainian Union "Fatherland" (Ukrainian: Всеукраїнське об'єднання "Батьківщина", Vseukrayins'ke Obyednannya Bat’kivshchyna) is a political party in Ukraine, led by Yulia Tymoshenko. The flag is a white horizontal flag, with the logo in the middle, as seen here: - https://pbs.twimg.com/media/BakRN8ZIcAAWkfS.jpg:large (third flag from left to right). http://rt.com/files/news/21/56/40/00/ukr-2.jpg (third flag from left to right). At <story.news.yahoo.com> there is a photo of "Members of reformist Yulia Tymoshenko's party smile holding their party flags during a rally in downtown Kiev, Ukraine, Sunday, March 9, 2003, with the ancient St. Sophia Cathedral in the background. Thousands of Ukrainians braved biting cold and icy conditions Sunday to take to the streets nationwide calling for scandal-tainted President Leonid Kuchma to resign. (AP Photo/ Efrem Lukatsky) "
The flag has many different shades, which one is true? My guess is that party flags do not have "official" specifications or construction sheets. If I had to guess I'd say the brighter B-Y-R are what the party members have in mind; the pastel shades (the faded blue and pink seem to go together) suggest faded specimens. According to Yulia Tymoshenko's website at <www.tymoshenko.com.ua>, her party's name is Batkivshchyna, which is translated "Motherland." The third stripe of this flag is not red but raspberry-red. Raspberry colour in Ukraine - symbol of cossacks. Flag of "Block of Yulia Timoshenko" (Donetsk section) according to a photo located by M.Revnivtsev at <dii.novosti.dn.ua>. The inscription can be translated to english as "Yulia Timoshenko Fan Club of Donetsk". The flag of the Christian-Democratic Party of Ukraine (Khrystyyans'ko-Demokratychna Partiya Ukrainy) can be seen at <cdpu.org.ua>. Christian-Democratic Party of Ukraine (Khrystyyansko- Demokratychna Partiya Ukrainy) - A small but long-established party headed by Vitaliy Zhuravskyy, it has nominated only 100 candidates, few of whom are well known. There are some pictures from May day demonstrations at <www.svd.se>. In the first picture is a flag with the Hammer & Sicle and some other symbol. It is from Kiev in Ukraine. In my collection there's some photos of several Ukrainian Communist parties. I have a photo correspondin to the reported one. Here the emblem is white but I have another photo where it is yellow and I assume that both colors are used. 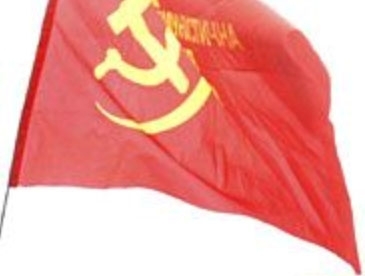 Flag of Communist Party of Ukraine. They use different flags: with yellow or white letters, with full name of the party or with abbreviation. At <www.mnk.iptelecom.net.ua> - Emblem of Ukrainian Nationalists Organization. The acronym is: OUN. At <www.mnk.iptelecom.net.ua/symvolika> - Flag of Ukrainian Nationalists Organization. Something may have changed: The emblem at <www.a-election.com.ua> doesn't include the "OUN" acronym, and the name found there is definitely "Congress" (Ukrainian acronym: KUN), not "Organization" (Ukrainian acronym: OUN). A minor change of the name and emblem lately? At <www.mnk.iptelecom.net.ua>, one can see the plain red-black flag at the bottom, and the same flag charged with emblem at the top. The site is in Ukrainian so I can only guess that either it is flags of two related movements or that this movement changed its symbol and flag to the upper ones. At <www.mnk.iptelecom.net.ua/mkun.gif> - emblem of Youth Nationalists Congress, youth ally of CUN. The words on an emblem: MOLODIZHNIY NACIONALISTICHNIY KONGRIES (Youth Nationalists Congress). At <www.mnk.iptelecom.net.ua/mnk_fl.gif> flag of Youth Nationalists Congress there are 4 words on the emblem on this flag, though I'm unable to read them.